If you have assignments that are both New and Working, the popup will show you the Working shipments that your items are going to be automatically added to as well with a green button next to them labeled Working. This cannot be edited and is for informational purposes only. 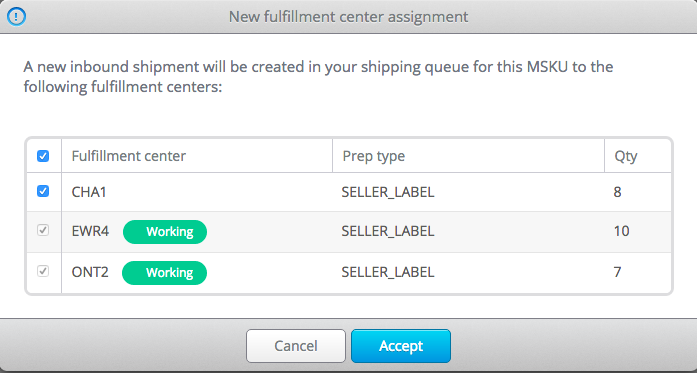 In the event that you have no new fulfillment center assignments, your items will automatically be added to the already Working Shipment available of the same prep type and fulfillment center. No popup will occur in this case. It is crucial that any shipments you have completed already are Marked as Shipped in Seller Central and not appearing in your Working Shipments section of InventoryLab.